...... Collision Course: The 42nd Anniversary of the "Easter Rebellion"
The 42nd Anniversary of the "Easter Rebellion"
Forty-two years ago today, on March 25, 1970, the Professional Air Traffic Controllers Organization (PATCO) launched a nation-wide sickout to protest an effort by the Federal Aviation Administration to forcibly transfer PATCO's leaders at the Baton Rouge, Louisiana, airport. The move was an effort by the FAA to weaken PATCO in the south. This job action came hard on the heels of the 1970 postal workers' wildcat strike, and caused great controversy. More than 3,000 controllers took part in the job action, which was illegal. Most were suspended and docked pay, and some lost their jobs temporarily (until a secret back room deal between labor and the Nixon administration brought about their rehiring). Those who took part in the sickout/strike were known as "horses" and proudly wore this pin on the anniversary of their job action in the years thereafter (photo courtesy of Ron Taylor). The "Easter Rebellion," as many controllers called it given that it spilled into that holiday, in many ways completed PATCO's transformation into a union. 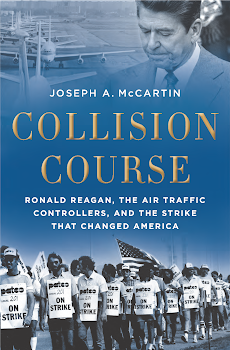 In some ways it also set the stage for PATCO's later miscalculation, fostering the belief that Reagan's administration too would cut a backroom deal rather than fire everyone who walked out on August 3, 1981. Today is a day to remember how a poorly designed federal labor relations system courted trouble in one of the nation's most important agencies, increasing the likelihood of a disastrous national strike the legacy of which still lingers.